It was a fulfilling and engaging week of learning as 17 lucky students and four teachers got an in-the-field perspective of why Geology Rocks. The program, run by the Hawkes Bay Branch of the Royal Society, harnessed local educational resources such as the National Aquarium, the Holt Planetarium, Faraday Centre and Napier’s Museum to foster student interest in geology, and to help teachers become ambassadors for geology and science learning. From all accounts it was a big hit, and TAG Oil was proud to help sponsor this valuable educational program. See a full report on what everyone, especially the kids, hope will be an annual event. Made possible through the efforts and commitment of the National Aquarium of New Zealand, the Hawkes Bay Branch of the Royal Society, GNS Science, the Hawke’s Bay Regional Council (HBRC), the Royal Society of New Zealand, Ngati Kahungunu Iwi Inc (NKII), and a number of other Napier groups. Report on Geology Rocks! : a course to inspire interest in science. ‘Geology Rocks’ was an initiative of the Hawkes Bay Branch of the Royal Society designed to inspire students’ interests in careers in science, using Hawke’s Bay educational resources such as the National Aquarium, the Holt Planetarium, Faraday Centre and Napier’s Museum, MTG. The programme ‘Geology Rocks’ was based at the National Aquarium of New Zealand in Napier in May 2015. It included field trips to Cape Kidnappers, MTG, and Waipatiki Beach. Seventeen intermediate and secondary Maori students (years 7 -10) from Flaxmere College, Hastings Girls’ and Karamu High Schools, and Napier Intermediate, plus four key support teachers, were chosen as their schools’ participants in the course. The aim of involving the four teachers was to encourage them to act as ambassadors for geology and science learning into the future. During the week, the teachers learned valuable tips about teaching geology from the GNS Science educator Julian Thomson, which will help them to continue to engage their school communities throughout the year. Three National Aquarium educators assisted the GNS Science educator who ran the programme. The aquarium educators were also there to learn more about geology and to increase their confidence in hosting similar programmes in the future. 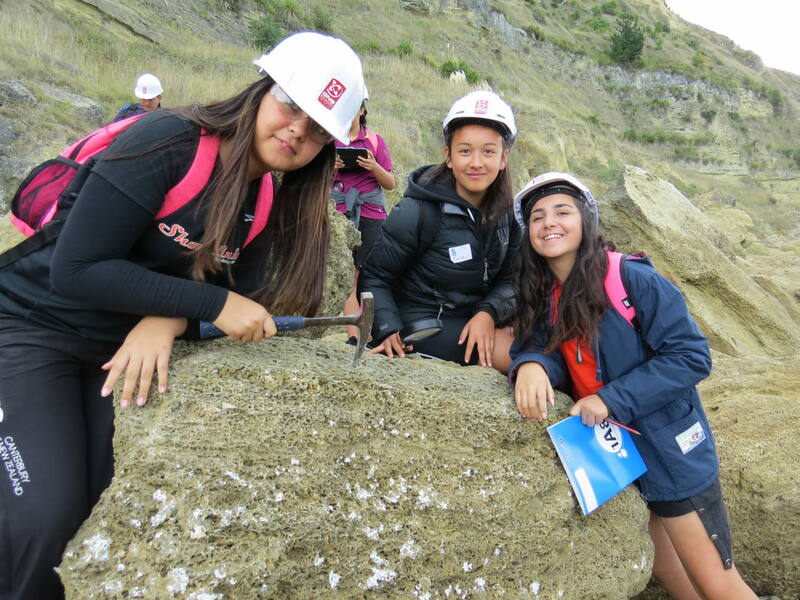 On two field trips, to Waipatiki Beach and Cape Kidnappers, students had the opportunity to learn about local landforms and their geological features. At the aquarium, students explored the exhibits which include some of Joan Wiffen’s Mangahouanga fossil finds. At MTG the students were treated to a classroom programme on earthquakes and their impact on society, drawing lessons from the 1931 Hawke’s Bay Earthquake. The session was rich with video clips and hands-on activities which captured the attention of the students. A “Taking it Further” presentation was held on Sunday 10 May at the National Aquarium. Students had the opportunity to show whanau and friends what they had learned and to consolidate their knowledge with oral and visual presentations. Morning tea was provided, giving attendees the chance to network and develop relationships with other communities. On the evening of Tuesday 5 May, at National Aquarium of New Zealand, James Crampton, from GNS Science, delivered an interesting and informative public lecture ‘Fossils: Rock Legends’ which many of the Geology Rocks students attended. 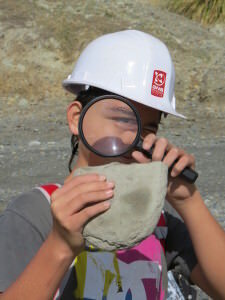 Geology Rocks programme was funded by the Royal Society of New Zealand, the Hawke’s Bay Branch Royal Society of New Zealand, Hawke’s Bay Regional Council, and TAG Oil NZ. The National Aquarium of New Zealand, GNS Science and MTG Hawke’s Bay were supporting partners with in kind donations of time and travel, venue and staff. The students and teachers were grateful for the opportunity to attend; here are a few of the students’ comments left in their evaluation forms. You can get more information if you ask questions. About the different layers, rock history and earthquakes. Where things come from and how they became what they are. What can happen if cliffs are eroded away. Meeting new people, gaining more knowledge about Hawkes Bay and its background. Exploring and going out on new discoveries; working together to excel our learning. The GNS Science educator Julian Thomson, who took a leading role in the course has said he would be available and interested in doing a yearly Geology Rocks programme. Richard Levy and Chris Hollis from GNS Science have also expressed opinions that this educational approach has worked and they would be happy to support it in the future. They ran a two week long GEOCamp for school students in Hawke’s Bay in 2012. They are keen to undertake more geological education in Hawke’s Bay in collaboration with Carol Larson at the aquarium and the HB Branch of the Royal Society.